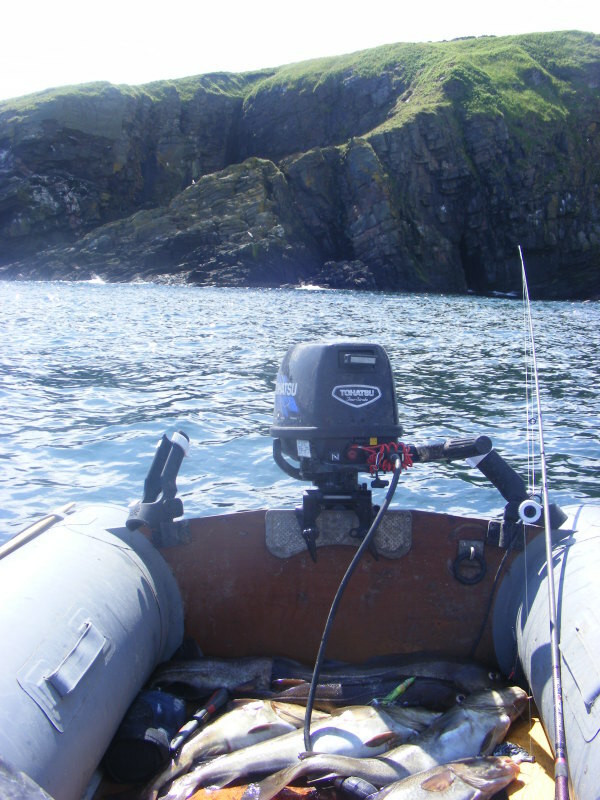 Been a couple of years since I’d taken the inflatable up to Aberdeen but it’s one of my favourite east coast venues, mainly because you end up with a different perspective on the shore marks you tend to fish at other times – an awful lot of the fishing is done within a few yards of the rock edges. I launched at Cove with the aim of heading up to Greg Ness and then working my way down to Findon over the day, spending a wee while on each of a series of marks close inshore. It ended up being a day with a good start and a happy ending, but a rather slow middle part. The slow part was due to a slight wind against tide problem for several hours – nothing dangerous but it destroyed the drift quite effectively, and hence the fishing. I still ended up with around 22-23 codling and a wrasse for my trouble – nothing above 5lbs but a nice day out for all that.